I know it's only May but now is a perfect time to start organizing your summer reading list and getting those books ordered, and I'll be bringing you a lot of great reviews in the next few weeks, so take note! If you are in the market for a feel good, put you in the mood for summer book, then look no further. The nationally bestselling author of Delilah’s Daughters and The Amen Sisters returns with a moving story about a single mother who discovers the woman she can be in one unforgettable summer. So, I'm going to start this review with just an observation I've noticed as a voracious reader: you almost never see a story featuring an African-American woman let alone have a cover as stunning and inviting as this one. I'm saying that as a totally white person, I could not be more white, and I've always noticed it and I don't know if anyone else does, but I jumped on this tour because it was exactly that. Nothing cookie cutter about this novel, it stands out on its own and it's good. It's a really good story that every mother can relate to, but more so if you're divorced and sharing custody of the children, and I absolutely loved it. And I wanted to be friends with Destiny because I can absolutely relate to her. Destiny is a single mother of twins and we learn right away that their father is the love of her life, but he felt differently and married some other chick. They are well off and Destiny isn't- she's struggling to make ends meet but give her kids a great life to the best of her ability but she always feels inadequate, though the ex and his new wife do nothing to reassure her. The twins will be spending the entire summer with their dad and stepmom in sunny California, far away from Destiny. While she knows this is an opportunity of a life time for them, she's upset because she can't be the one to provide it. Meanwhile, her friends (and her mother, who can be a bit overbearing and a bit of a nag) are harping on her to use this time away from her children to work on herself. Maybe go back to school and get closer to a degree so she can get a better paying job, leading to more opportunities. Maybe meet a man, or at least get herself out there, and not give up on the chance at love again. She meets Daniel through a friend and that basically starts her off on a summer to remember for her own self. I flew through this book over the course of one day, curled up in my favorite chair under blankets because it is still ridiculously cold for spring where I live, dreaming of being on a damn beach with some sunshine. This book put me in the summer mindset and it is just a really great chick lit story line. I really liked Destiny because I feel like if Matt up and left, I'd be in the same spot as her. It's hard to get momentum when everything seems so hard and it's hard to make a decision on anything when you don't know what you want. You plan your whole life to be a certain way and when that doesn't happen, you lose steam and direction. I totally get it. It does have a good ending and you leave Destiny feeling like things are going to be alright for her, and ultimately that's all I wanted in this book. But don't worry, this isn't all schmoopy love, it's got a scandal! The book is lighthearted and fun, it's about female empowerment and ultimately taking care of yourself to be better for other people, something all of us should be doing anyways. 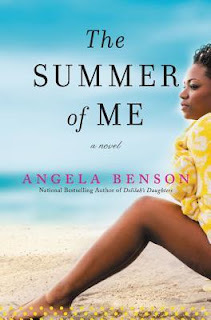 To get your own copy of The Summer of Me, head over to Amazon or Barnes & Noble. In the meantime, you can check out author Angela Benson's webpage and her Facebook page for more information on her other books, she's got a few of them! As a recently single mom looking head to my first summer without my son, this book sounds like something I could really related to!